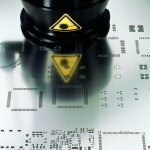 Laser cut solder paste printing stencils from BEST provide SMT assemblers the ability to print controlled volumes of solder paste in tight registration onto PCB pads. This helps to insure that PCBs are assembled to the highest quality standards. Flexibility in responding to your demands. Our company was built on responsiveness to PCB rework and repair needs-an area where speed is required! Engineering support-Highly skilled, dedicated work force that understands your requirements. Expert laser knowledge enables BEST to produce a full laser cut stencil at the price and the speed you need to operate your business in a competitive environment. BEST has multiple lasers and is able to cut numerous types of materials. Call BEST today for your next laser cut prototype or framed stencil at (847) 797-9250..